Home » How to create Excitement for a Design Sprint? A Design Sprint is a thrilling experience. You get to collaborate with your clients on trying to crack problems that deeply concerns them. However, a Design Sprint also requires a big leap of faith. What you ask them is to agree on a process, much more than an outcome. That’s not a small thing to ask. You will need to take away a couple of anxieties first. Not only to reassure them, but also to give them the ammunition to persuade their stakeholders. I want to share five insights we’ve learned over the last couple of years. Tip 1: Address process anxiety at the start of the sprint. 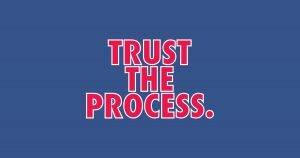 I always begin my sprints with a “trust the process” slide. I acknowledge that their will be times when they will become a bit impatient, or that they will become worried about where the outcome is heading. I warn them that a design sprint is a systematic creative approach to turn profound insights on how their customers think and behave into innovative solutions. The best way to come up with new answers to solving problems is to be patient and to resist the urge to come up with ideas and solutions too fast. When you address this at the start of your sprint, you can come back to it easily whenever friction arises. Whether the goal of the sprint is to create new value propositions or service and product innovations, the underlying promise is that the Sprint will provide them with a systematic approach to solve customer problems. 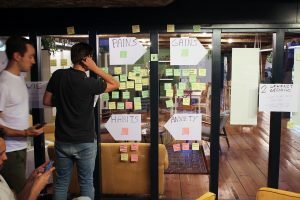 The beauty of a (behavioural) design sprint is that its setup forces the participants to approach the problem with a rigor they haven’t probably experienced before: The sprint method forces them to get a better understanding the problem. It forces them to formulate hypotheses on how to solve those problems. It forces them to prototype multiple solutions, and finally, it forces them to learn which prototype works and why it works. By going through these steps, the (Behavioural) Design Sprint protects client teams against their own biases, and it protects them from the HIPPO in the room. The HIPPO is the Highest Paid Person in the Organization, who believes he/she is being paid to know best what the right strategy is. This alone already makes a sprint incredibly valuable. A Behavioural Design Sprint requires a considerable investment of time and money. You can’t do a sprint properly if you haven’t got a full-time dedication from your clients. Moreover, a Sprint with experienced Sprint Facilitators also requires a financial commitment. However, look at it this way: First of all, there’s a huge hidden cost of not developing a strategy through rapid prototyping. Imagine you come up with a strategy yourself and you ask your advertising/digital/design agency to execute it. Only to find out that you acted on the wrong assumptions after you produced the whole campaign or designed the product innovation. A (Behavioural) Design Sprint – and the act of prototyping and testing – at the start of your process minimizes this risk and maximizes the chances that you will be doing the right things and doing them right. “There’s no such thing as a smooth waterfall from research to strategy to creativity to production. In every step of the process, everyone always wants to reinvent the wheel all over again”. Another way to look at the cost of a behavioural Design Sprint is to compare it with how things are usually done. First clients pay a research agency to do the research. Then they hire a strategy consultancy to help with the strategy. Then they hire a design or advertising agency to bring the strategy to life. Not only do they need to pay three different agencies, but the level of noise and the loss of insights that this process produces is just gigantic. There’s no such thing as a smooth waterfall from research to strategy to creativity to production. In every step of the process, everyone always wants to reinvent the wheel all over again. I always found that once the sprint team embraces a shared language to look at the sprint goal, to define the real customer problem and to ask the right questions in the ideation round, magic starts to happen. For us, this is one of the most powerful benefits of our Behavioral Design Method. However, this applies to every human-centric framework you will use. When everyone is trying to answer the same customer-centric questions like “Are we really solving the customer’s Job-To-Be-Done, or “Is this a real customer pain?” or “Are we sufficiently taking away anxieties and other barriers” or “What can we do to make the desired behaviour easier?”, you will witness that you have created a group that is will dedicate itself to solve the problem together. Video: The Influence Framework: A magical tool to turn human understanding into ideas for Behavioural Change. Learn more about SUE’s Behavioural Design Sprint, a five-day sprint to solve critical marketing and business problems. We combine the method of Design Thinking with principles from Behavioural Psychology to discover human insights, come up with solutions that change behaviour and test them right away with the target audience to learn what works and why. How can we help with your Challenges? 1. Get inspired, Subscribe for free to our popular bi-weekly mail on Behavioural Design skills. 2. Get answers, Do a Behavioural Design Sprint with us and come up with proven strategies to change behaviour. 3. Get skills, Book a seat at a two-day masterclass to become a certified Behavioural Designer.